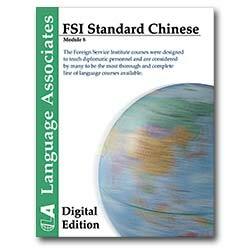 Buy FSI Standard Chinese (Mandarin) Digital Edition now and receive it today! This is the same content from the hardcopy editions, but with the text in PDF format and the audio in MP3 format. Downloads are compressed RAR format files, so when you purchase, please be prepared to download one or more large (>100 MB) file. Software to unpack RAR files is commonly available; a free open source compression manager is available at 7zip.org. Upon purchase you will leave this site; this is normal, our download store is supplied through Paypal by a separate service provider. We accept payments for download products by Paypal, Visa, and Mastercard. Thank you for your interest in our downloads. Delivered by download as 1 RAR format file. The Language Associates Digital Editions are the popular FSI courses in full digital format - all course material is included, but all audio is in MP3 format and all reading material is in PDF format. These courses are widely considered to be the best and most complete language courses available. Get the benefits of full FSI courses with increased portability and substantial savings! Direct from publisher for less than 1/2 of our CD format price! Delivered by download as 3 RAR format files. The Language Associates Digital Editions are the popular FSI courses in full digital format - all course material is included, but all audio is in MP3 format and all reading material is in PDF format. These courses are widely considered to be the best and most complete language courses available. Get the benefits of full FSI courses with increased portability and substantial savings! Direct from publisher for less than 1/2 of our CD format price!